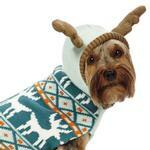 Zack & Zoey® Elements™ Antler Sweaters will provide warmth for dogs, and smiles for all who see them! The Folkloric Scandinavian look comes from the intricate Fair Isle knit construction that's crafted especially for your pet. We love the gorgeous color combinations of teal and mint with coral and tan accents. The European square cut provides maximum coverage for warmth and the high-cut tummy keeps your dog clean and dry. The slit sleeves provide a sleek look that doesn't impede your pet's movement. The adorable hood can be worn up or down. The antlers have a bit of stuffing in them to allow them to stand up when the hood is worn on chilly days. The leash access hole enables your dog to be safely walked when the hood is up or down. This sweater is great for the holidays and all season long! It's a fun choice for a toasty walk or special photo shoot. Don't forget to submit your pet's photos below for a chance to be selected as Pet of the Day and possibly win a $250 BaxterBoo.com shopping spree! See photo contest rules for details. Made of 100% acrylic. Hand wash in cold water. Line dry. 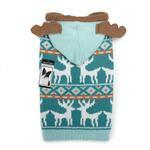 Zack and Zoey Elements Antler Dog Sweater - Teal Customer Photos - Send us your photo! Pebbles loved her Christmas sweater! It fit her perfectly and kept her warm and festive. Doesn't she just look precious? McKenna Rose loves wearing clothes and posing for pictures. She's staying warm wearing a gift from Santa, Baxter Boo's Antier Dog Sweater. Our Zena is our sweet baby girl that we rescued the day after thanksgiving, she is 1 1/2 years old, she is a chihuahua, jack russel and pekingese mix! We absolutely love her???? she loves her new cozy reindeer sweater! Keeps her toasty being she’s only 8 lbs! Zuzu looks ready for fall in her new Antler sweater by Zack and Zoey ?? Sassy but classy, Capucine is feeling warm and wonderful in her gorgeous sweater! Royce is my three year old rescue pug. Funny, loving and energetic he loves to play at the dog park. We have been together for one year and I can't imagine my life without him. Who rescued who? Mumbai loves his Antler sweater and even doesn't mind wearing the hoodie!!! He is a show off!!!! Chloe showing off her Zack and Zoey reindeer sweater! My boys are rescues from Japan! The reindeer sweater are awesome! I love the large slits for the armholes. 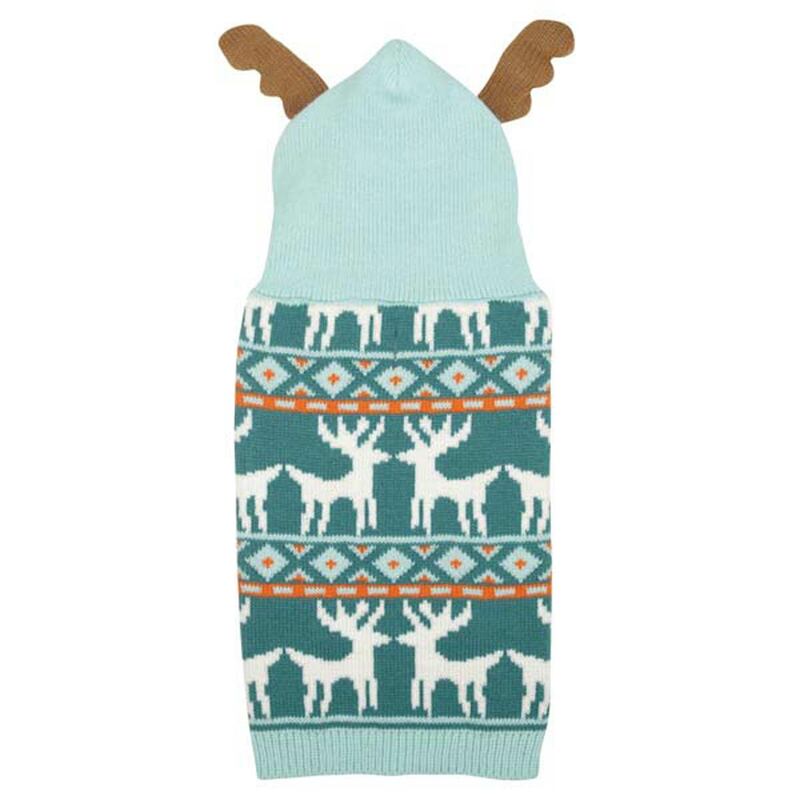 Boscoe has a bum leg, so getting it into a tight armhole is impossible.And I love reindeer! It's a win-win! Reggie looks so cute in his antler sweater. He charmed all of his mom's colleagues. Ace is a one year old mini Aussie who loves to be outside in the cold Ohio weather playing with his soccer ball. Now he can stay out even longer with his warm sweater! He loves it! Charlie is my 4 month old Lhasa Apso wearing Zac and Zoey Elements Antler Dog Sweater Teal and loves it! Fits perfectly and it's beyond cute! Posted On 01/19/18 by Ashley C from Penllyn, PA Yes, Ashley C recommends this product! This sweater is too adorable and fits my dachshund, Pebbles, perfectly! It is the perfect Christmas sweater. It keeps her warm and kept her looking festive for Christmas. The material is really soft and it's very easy to get on. Would recommend to everyone! Posted On 11/08/17 by christina m from , Yes, christina m recommends this product! This sweater is adorable and fits my puppy with some room to grow. Super Cute Winter Wonderland Sweater!! Posted On 10/20/17 by Drew M from Fargo, ND Yes, Drew M recommends this product! Received the item extremely fast and it was more adorable in person then online! Such a cute item for my lil fur-baby to wear in the upcoming holidays! Highly recommended! Posted On 08/31/17 by Deni S from New York, NY Yes, Deni S recommends this product! Goes on easily and fits Zuzu very well but the hood is a bit on the large side and goes over her eyes but it's cute for photos but won't use the hood when she's walking around. Love the sweater. Very cozy. Posted On 08/27/17 by Deni S from New York, NY Yes, Deni S recommends this product! So I find that getting the correct size with any outfit is tricky business, even when I take into consideration the exact measurements of my dog. So it's always a gamble really. Thankfully this adorable sweater in the XS size fit my 3lb poodle very well. The hood is so cute but really can't use it since it flops over her eyes. Posted On 08/08/17 by Susan S from Bellevue, OH Yes, Susan S recommends this product! This sweater is beautifully made.I was so happy to get mine ordered since it was sold out last year! The sweater is lightweight and that's perfect with my Bichone 's double coat! Just love this.I also bought this on sale which really made a sweet deal! Posted On 07/31/17 by Hannah M from Chicago, IL Yes, Hannah M recommends this product! Very soft, comfortable, and adorable. The one thing I would say is the sizing runs a little big. I got a small and its a little too big on my Mini Dachshund and smalls normally fit him. Love the antlers. Posted On 07/25/17 by karen w from Santa Monica, CA Yes, karen w recommends this product! Posted On 02/05/17 by Karlee B from Atlanta, GA Yes, Karlee B recommends this product! This sweater is so adorable. I love the hoodie antlers. The material is very soft, which I love, and my yorkie looks so cute wearing it. I also love that there is a slit where a lead can connect to a harness underneath. I ordered a size up since my pup's chest measurements were so exact that I was afraid it would be too snug. The larger size is still comfortable on him without looking like he's swimming in it. Posted On 01/10/17 by Sharon B from Mobile, AL Yes, Sharon B recommends this product! 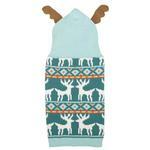 This sweater is warm and adds an extra touch of cuteness with the little deer antlers. So cute for this time of the year.....HAPPY HOLIDAYS,!!!!! Posted On 12/20/16 by Lauren W from Minnetonka, MN Yes, Lauren W recommends this product! I purchased this sweater for my hairless Chinese Crested, and it is adorable! It is true to the sizing chart and fits him perfectly. It is also long on the back, which I appreciate. Great price too! Overall I'm very happy with the purchase! Posted On 12/19/16 by Sally M W from Houston, TX Yes, Sally M W recommends this product! The holiday sweater we bought for Molly is adorable! I think she actually likes wearing it! It's good quality and a cute design. This is perfect in every way. My dog looks darling in it and it's great quality. Highly recommended. Posted On 12/06/16 by Stacey B from Crossville , TN Yes, Stacey B recommends this product! To be looking good during this and many holiday season is a sweater that only my little one FLOKI looks great. We are so busy during this holiday so cold my dog has to look good and warm .....the antlers just ad that special touch. Posted On 11/16/16 by Sandee F from Vineland, NJ Yes, Sandee F recommends this product! This sweater is way cuter than the picture! It's well made and has big slits for the front arms instead of tight holes. The slits made it much easier to put on my dog with the gimpy arm. The x-large covered their backs and fit nice and snug. The hood is difficult to keep on, but looks very cute when it does. I love the antlers! The color is a gentle seafoam and the material is very soft. Overall, I love the sweater! Posted On 11/11/16 by Amaya M from NA, Yes, Amaya M recommends this product! It's high quality, warm and adorable! The antlers are floppy so keep that in mind. I love the design and how great this looks on my Yorkie mix! Posted On 10/30/16 by Laura B from , NE Yes, Laura B recommends this product! Got this for my moms weiner dog pup. He's hard to fit due to length. This fits pretty well but is a bit long on him. Its very cute and of good quality. My mom will adjust it somehow to make it work until he grows a bit more. Overall happy with product. Posted On 10/24/16 by Susan G from West Lawn, PA Yes, Susan G recommends this product! My bichipoo boy has the tan one and now his sister is the proud owner of this teal sweater. It is a great fit and looks adorable with the hood up or down. We waited for this one to come in her size for a few months, but are glad it appeared this season. My one dog got the tan for Christmas; my other dog was waiting for this to be in stock. They look adorable wearing them. The fit is great and the antlers provide a cute look. Posted On 04/25/16 by Sarah H from , MO Yes, Sarah H recommends this product! This is a great purchase for the winter or just wearing around the house on very chilly days. A thick, warm weight that is made adorable with the antler hood! Small/medium is the perfect size for my min pin that weighs 12lb 10 oz. Posted On 01/02/16 by Monica G from North Jersey, NJ Yes, Monica G recommends this product! This sweater is too cute! Good quality, fits true to size. Posted On 12/13/15 by Kathy B from Glenview, IL Yes, Kathy B recommends this product! Charlie, my 4 month old Lhasa Apso, absolutely LOVES his reindeer sweater! It's cute, comfortable, and the hood fits perfectly (most sweater hoods are made too large). Plus the coloration is so pretty and the fit is true. I'll add his picture if I can. Love it! Posted On 12/01/15 by Peggy B from , MI Yes, Peggy B recommends this product! This is a roomy sweater that is warm and adorable! Posted On 11/27/15 by kim b from Libertyville , IL Yes, kim b recommends this product! Runs a little on the large side. I have a chihuahua he is about 7 pounds it is just long on him. Otherwise it's adorable and I know he's warm. Now Doggy Can Be Merry AND Cozy! Posted On 11/16/15 by juanita b from portland, OR Yes, juanita b recommends this product! This little sweater is thick and well made. Our bichon poodle, Jake, has always been happy in Baxter Boo jackets and sweaters, while we've been happy with the great price and good quality of items we've purchased. But these reindeer "horns" are simply too cute for words. If Santa needs help with the sleigh, we know someone who is dressed up and ready to go. It's a bit snug around the tummy, but that's Jake's fault, not Baxter Boo's. Posted On 11/11/15 by Megan P from , NV Yes, Megan P recommends this product! 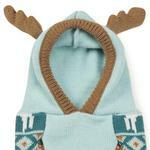 The antler hood is the cutest thing ever. It is warm also and is useful in the 20 degree weather when he has to go out for brief times. very nice product. Posted On 11/08/15 by Jennifer C from Pittsburgh, PA Yes, Jennifer C recommends this product! I love it and so does my maltipoo, Milou. True to size and adorable! Posted On 11/02/15 by Verally C from Chicago, IL Yes, Verally C recommends this product! Very cute! Runs a little big but I love it! I'm hoping it will shrink if I dry it. Overall awesome place to buy my pooches some clothes.